Thermedic Units provide support and compression as well as hot and cold therapy all in the SAME UNIT. Unlike standard heating products, in each Thermedic Unit, an advanced carbon fiber fabric emits FAR infrared, thus delivery deep penetrating heat into joints and soft tissues. There are 3 settings to control the temperature. Thermedic promotes vasodilation and has been measured to increase the volume of blood flow by over 200% and the rate of blood flow by 89%, without over heating the surface of the skin. Thermedic has an interchangeable flexible cold pack insert, housed in a protective mesh. This is suitable for acute injuries and pain or where there is inflammation. Thermedic provides ergonomic joint support. Premium neoprene is used to support the joint and varying degrees of compression can be applied using the velcro fastenings. A protective fabric mesh supports both the infrared element or cold pack, making Thermedic ideally suited for fuss-free interchangeable hot and cold therapy. There is no other product which compares. Take your rehabilitation to the next level with our Thermedic Units. This device makes it so simple and easy for you when treating areas of pain. THREE IN ONE PROVEN THERAPY! HEAT THERAPY - Far Infrared Heat Energy reduces muscle tension and joint stiffness, penetrates to deeper tissues to boost blood circulation, increase metabolism and accelerates healing. COLD THERAPY - In hot and cold therapy, the Cold Pack narrows vessels and decreases blood flow, reducing swelling and inflammation within the first 24-48 hours of the acute stage of an injury to prevent tissue damage. BRACE - Ergonomic and breathable braces provide more support and comfort on your body part. Compared to conventional heating pads which only produce �surface heat�, the Thermedic Far Infrared product line uses the superior far infrared (FIR) technology. FIR is a scientifically proven form of heat therapy that works more efficiently and effectively than traditional heating techniques. Whether you have a sports injury or chronic pain, our pads and braces are more effective than others. Far infrared is a completely safe form of thermal radiation, as it does not emit harmful Electromagnetic Frequencies (EMF) like most other electronic heating products. Unlike conventional heating technology which uses metal wires as heating elements, the unique Thermedic heat therapy technology uses Cabric�, a carbon fiber fabric which in itself is electrically conductive and therefore does not use any wires. The fabric naturally emits infrared energy which supports various therapeutic applications. 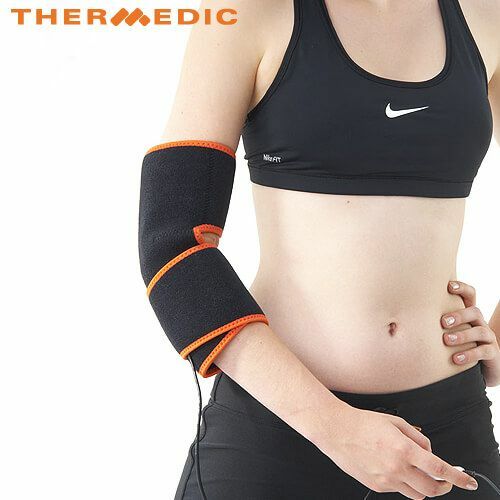 No matter if you are suffering from acute or chronic pain or just use it for preventive therapy, Thermedic�s extensive product line of hot and cold therapy braces and pads is the right choice. FIR is absorbed by the human body through �resonance absorption�. FIR energy occurs within the same wave-lengths as the molecules of the human body. Therefore it corresponds with the human body at the same resonance level. FIR energy travels in straight lines and is easily absorbed by the human body, reaching as far as 4-7 cm into muscle tissue. FIR heat reaches inside the body not just on the surface. Due to this effective healing of sports injuries, our hot and cold therapy product is known as the "professional triple cold hot protector" for some swimmers. FIR energy improves blood circulation in the affected area. This improves your body's ability to remove waste, such as dormant cells and lactic acid, from muscle fibers, significantly improving your ability to recover after a sports injury. Upon entering the human body FIR energy causes a warming effect by activating molecules and body cells. FIR energy activates the cells, increases blood vessel resilience and promotes cellular functioning. Best of all, FIR energy provides fast, effective pain relief to sore muscles and joints.